Writing Nursing is a tedious task because students need to be aware of the concepts, importance, aim and use of various models. For example, a nursing student may have a detailed knowledge about Gibbs', Johns' and Driscoll (by Borton) models. If you have any questions or queries about your nursing assignment, then you can choose our Gibbs Reflection Nursing Assignment Help service. Gibbs Reflection Nursing Assignment Help service is a platform for university students to get help in their academic assignments. Various nursing experts are available with the same academic background who help them in writing your assignment easily and errorless. What is Gibb’s Reflective Cycle? Graham Gibbs published his Reflective Cycle in the year 1988. It is a theoretical model used in health profession. This model was developed from David Kolb’s four stage experiential learning cycle (1984) theoretical model. 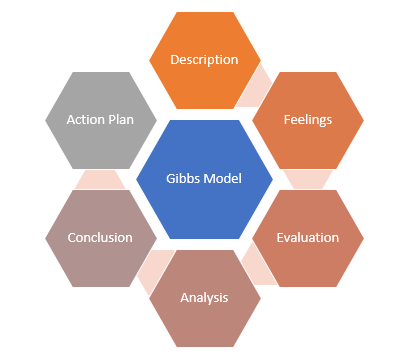 Gibbs reflective model includes six stages, i.e., Description, Feelings, Evaluation, Analysis, Conclusion, and Action Plan. In theory, the reflective process includes the Gibbs 6 model steps in which each step informs the next one. But when it comes to practice, then students often get confused with Evaluation, Analysis and Conclusion. These stages have similar questions which results a lot of repetition while answering the questions. Analytical writing is needed only in Analysis stage. The other remaining steps such as Description, Feelings, Evaluation, Conclusion and Action Plan are statements of description, statements of valuation, statements of summation. If you still have any confusion about the use of Graham Gibbs’ model, then you can connect with our experts who provide online Gibbs Reflection Nursing Assignment Help service. Our nursing assignment experts have tried to present the Gibbs Reflective Model aim with the help of a diagram. If you have included an introductive and conclusion part, then your assignment may have the following structure. The introductive part should include the experience where it was held and how long it lasted. You can also include the Gibbs’ model. The descriptive part includes Description Feelings Evaluation Analysis Conclusion Action Plan. While writing the conclusion, you may not repeat the conclusion of Gibbs’ model stage 5. You may need to identify the strengths and weaknesses and how they can be improved. If you are still looking for any further help, then reach out to our Gibbs Reflection Nursing Assignment Help online service. My Assignment Services were launched years ago and since then, we have satisfied thousands of students with our services. If you are a nursing academic student and your professor has asked to write nursing assignments using Gibbs’ Model and are facing issues while writing it, then you can should contact our experts who provide Gibbs Reflection Nursing Assignment Help. Here, a team of experts is available to look into your assignment’s concern. You can ask our experts available for online Gibbs Reflection Nursing Assignment Help service. Our services are available in different cities of Australia such as Brisbane, Adelaide, Perth, Sydney, and more. You can connect with Gibbs Reflection Nursing Assignment Help Online easily by dialing their helpline number or via online chat.